Starting on February 8th, AgeCare is hosting multiple hiring fairs in NE Calgary to grow their Nursing, Health Care Aide, Food Services and Housekeeping teams. 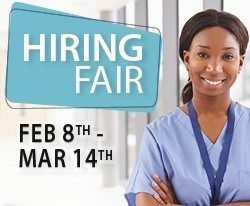 Calgary, Alberta – AgeCare will host 8 hiring fairs in February and March at the Genesis Centre and Vivo Centre in North-East Calgary to fill Registered Nurse (RNs), Licensed Practical Nurse (LPNs), Health Care Aide (HCAs), Food Services, and Housekeeping positions. Job-seekers are asked to bring their completed AgeCare application form and resume with them to the hiring fairs. Upon arrival, they will have the opportunity to have their first interview on the spot! AgeCare SkyPointe is a Designated Supportive Living & Long-Term Care Community in NE Calgary that will offer compassionate, high quality, resident-centred care in a culturally rich and diverse environment. With the capacity of 352 funded beds, AgeCare SkyPointe is nestled in one of the most multi-cultural areas of Calgary, where it will provide a home-like environment that will reflect the cultural preferences and tastes of its residents; including dining experiences and recreational programming. AgeCare is dedicated to creating vibrant communities that celebrate and support aging with dignity, independence and community interaction for seniors and adults requiring continuing care or Independent Retirement Living.